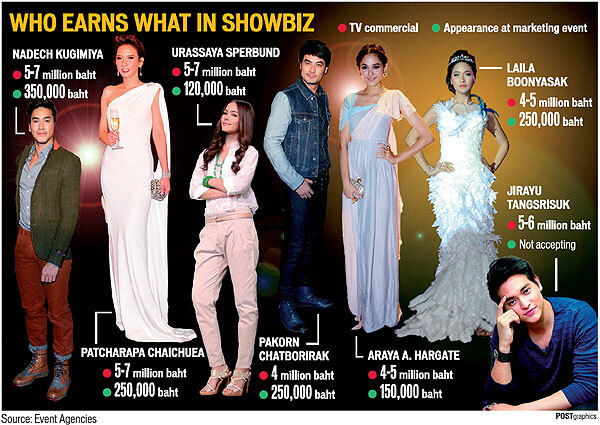 Thai celebrities cost how much?! Its just fun to read things like this, when compared to what international musicians/movie stars charge then Thai celebs are far cheaper. Tan Passakornnatee, founder of Ichitan ready-to-drink green tea, and Ittipat Kulapongvanich, founder of Tao Kae Noi seaweed snacks, believe they can promote their brands without the help of celebrities. Mr Tan said his company’s marketing costs are about 10 times less when not using celebrities. Featuring himself as the presenter for the brand he can get the same successful results and sometimes better than expected. Perhaps he fails to realise that he himself is a celebrity. Thai Airways has a communication problem? !